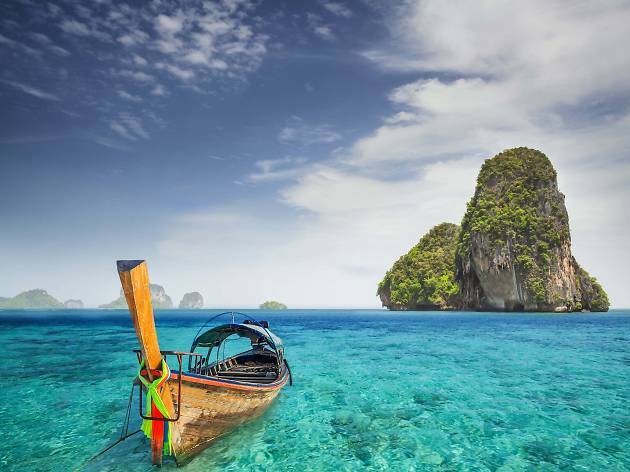 There are many charming things to do in Krabi. You can explore beautiful beaches and world-class nature encounters. 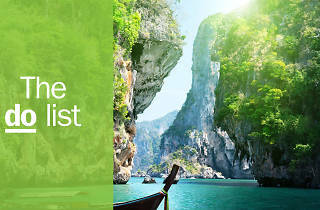 Amazing things to do in Krabi about; the destination has all the hallmarks of paradise – immaculate, sugar-white beaches for lazing around in, blue lagoons for swimming, crystal-clear seas for diving, towering limestone rock formations for scaling, and dense jungles and expansive hills for hiking—plus some of the best hotels in the world. 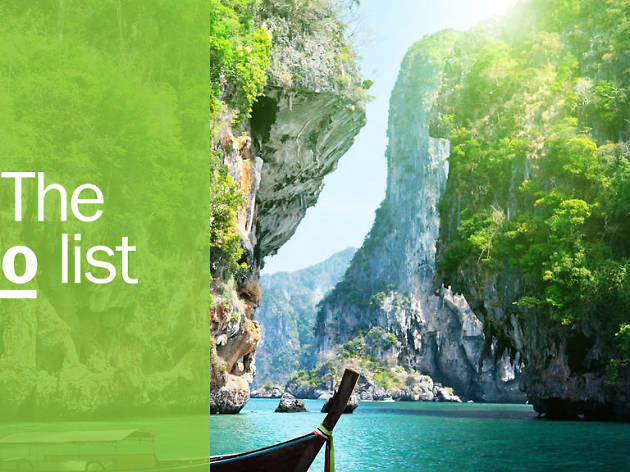 Whether you’re a sun-worshipping beach-lover or thrill-seeking outdoor sports junkie, you’ll find your bliss in this magical destination. Here are the best ways to lose yourself and indulge in everything this Southern Thai province has to offer. What is it? A drop-dead-gorgeous peninsula. Why go? Rimmed by four stunning beaches, this peninsula is the perfect place to drink in picture-perfect scenes involving bright green waters lapping onto ridiculously soft, white sand. 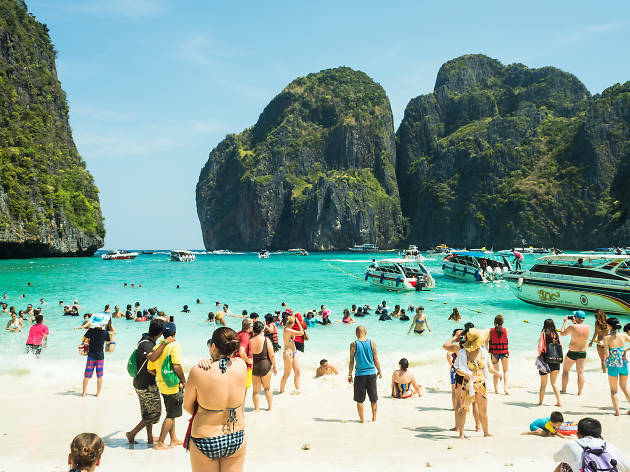 Railay is riddled with watery caves, hidden lagoons and jagged limestone cliffs; there’s much to do in terms of snorkelling, exploring and rock-climbing in between trying to get the perfect tan. What is it? A natural pool that lives up to its name. Why go? An abundance of minerals from surrounding limestone hills gives this pool its sparkling green shade. 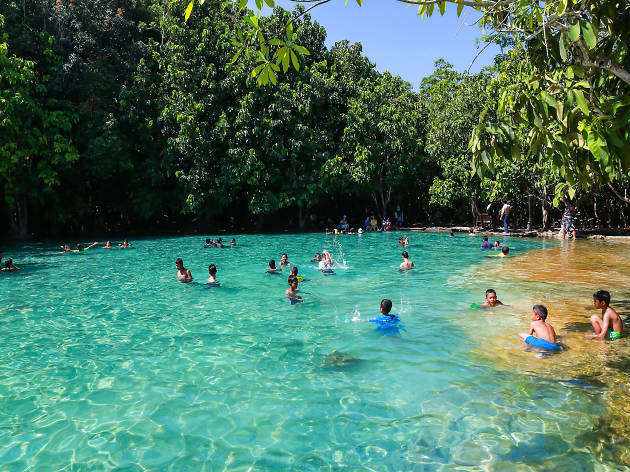 Part of the Khao Phra Bang Khram Nature Reserve, the Emerald Pool is filled with pure spring water filtered from thermal hot springs that are deep underground. To get here, you can either walk 800 metres through a well-trodden path or take a longer nature trail that winds through dense tropical rainforest. Either way, you’ll end up wanting to swim in the refreshing lagoon to cool off. Come early or in the late afternoon to avoid the crowd. What is it? A pool filled with warm water from underground thermal springs. Why go? 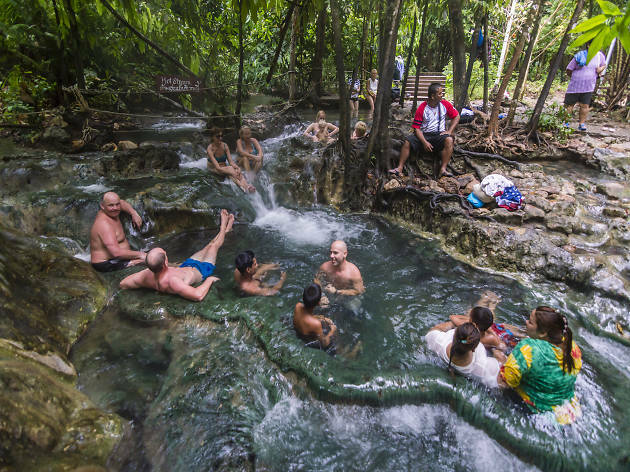 Krabi’s ‘hot tubs’ will melt away your stress (and/or hangover). Shaded by lush green rainforest, Khlong Tom Hot Springs is one of the most popular places in Khao Phra Bang Khram Nature Reserve. 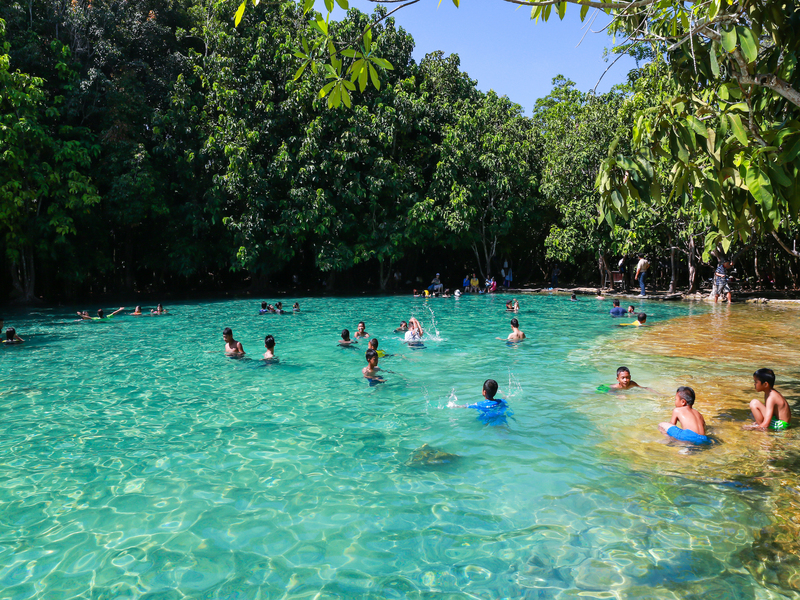 Like the neighbouring Emerald Pool, it’s not only a feast for the eyes but also a joy for the soul. The underground thermal springs continuously pump large amounts of soothingly warm, supposedly curative water into the pool, ensuring a renewing experience every time. What is it? Thailand’s most popular island. Why go? Despite all the hype surrounding it (it's been in countless films and is on the bucket list of travellers across the globe), Koh Phi Phi doesn’t disappoint. Massive karst formations dominate the landscape, with a dazzling panorama of crystalline turquoise waters and abundant coral reefs waiting below. There are hidden beaches and beautiful lagoons, and coves that draw you into its golden-sand embrace. What is it? One of the earliest sites of human civilisation in Thailand. Why go? Ban Bor Thor, a quaint town about 50 kilometres north of Krabi Town, features a complex system of lagoons, mangrove forests and limestone caves. The caves feature a large number of ancient paintings, proving the existence of prehistoric seafarers who would take shelter here when sea conditions were not suitable for trading. The most thrilling way to take in the full panorama of peaks, water and ancient art is undoubtedly by sea kayak. 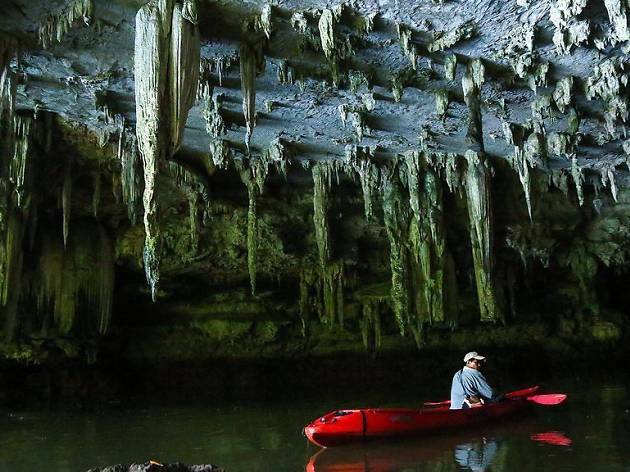 Paddling through the many natural tunnels makes for a slow-paced and immersive experience. What is it? A sacred mountain that offers one of the province’s best hiking trails. Why go? If you get bored of spending time on the beach all day (yes, it’s been known to happen), Dragon Crest Mountain in the north of Krabi offers an excellent opportunity to log in some time among dense vegetation. Though only about four kilometres, the trail is steep and nearly vertical at certain points, so it will take a while to arrive at the peak. 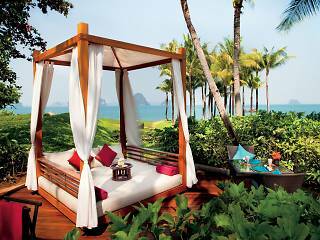 You are rewarded, however, with panoramic views of the gulf and Krabi’s stunning landscape. A jutting rock at the summit is a famous spot for taking ‘living life on the edge’ photos. What is it? 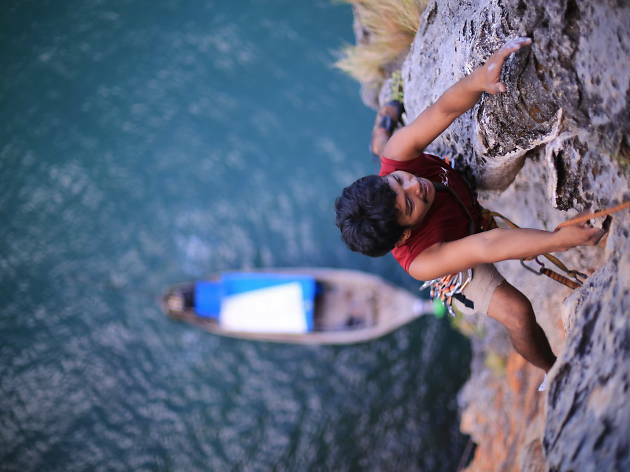 One of Southeast Asia’s top climbing destinations. Why go? Tonsai has long been a favourite for international climbers, combining world-class routes with amazing scenery and a chilled vibe. Climbing takes many forms, with options for first-time punters, hard-core experts, free climbers and line slackers. Most times, scalers are lowered off a climb straight into a bar where a mango smoothie or an ice-cold Chang beer awaits. What is it? A small bustling market town. Why go? 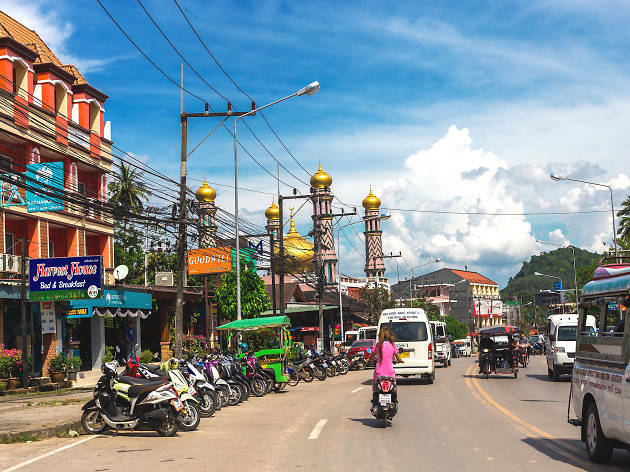 Best known for its old-world bars, quaint cafés and vibrant night markets, Krabi Town is the place to get a taste of the local culture. Explore the many night markets packed with stalls selling handicrafts, clothing and souvenirs, as well as a great selection of street food. Take a stroll on the docks, idle the day away by the seaside with a cup of coffee, or mingle with the locals in one of the town’s beautiful parks. What is it? A beautiful temple located atop a craggy cliff. Why go? There are no tigers at this temple. Instead, you have macaques, some of which won’t hesitate to hitchhike on your back as you make the precarious 1,237-step climb up the cliff where the temple is located. That is a lot of steps. Most are steep and uneven. Your reward? 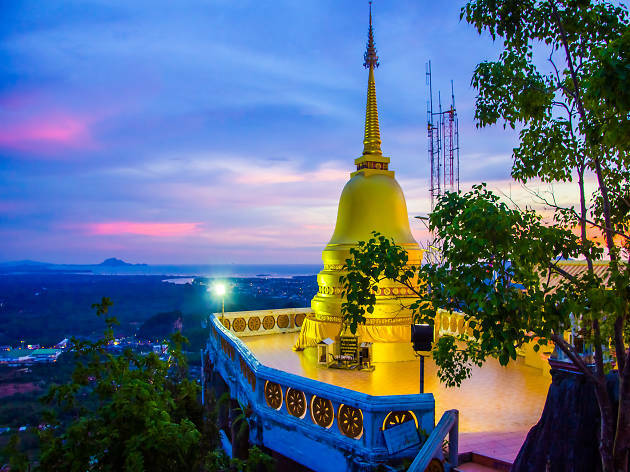 A magnificent aerial view of Krabi’s undulating forest-clad landscape and the glittering Andaman sea, and a photo with a gigantic gilded Buddha statue. What is it? Two of the most famous dive sites in Thailand. Why go? 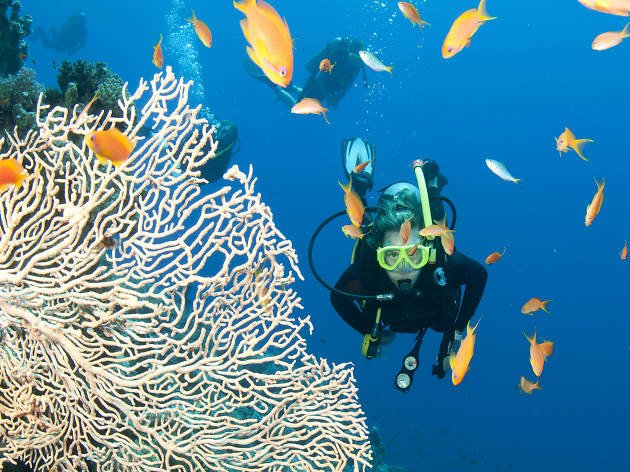 Located in Koh Lanta, the southernmost part of Krabi, Hin Daeng and Hin Muang are huge underwater rock formations teeming with colourful corals and rich marine life. These sunken sanctuaries will make you wish to swap your lungs for gills, home as they are to millions of small reef fish, boxer shrimps, octopus and moray eels. This absolute gem is also a pit stop for fish looking for a meal; jacks, wrasses, reef sharks, mantas and whale sharks are common sights. Due to its depth and the potential for strong currents, these sites are more suitable for advanced divers. What is it? Sun, scenery and splashes down a picturesque river. Why go? The experience has moments of pure thrill and at times of absolute serenity. Enjoyable for both newbies and experienced paddlers, the scenic Songprak River combines whitewater rushes with manageable drops and turns. 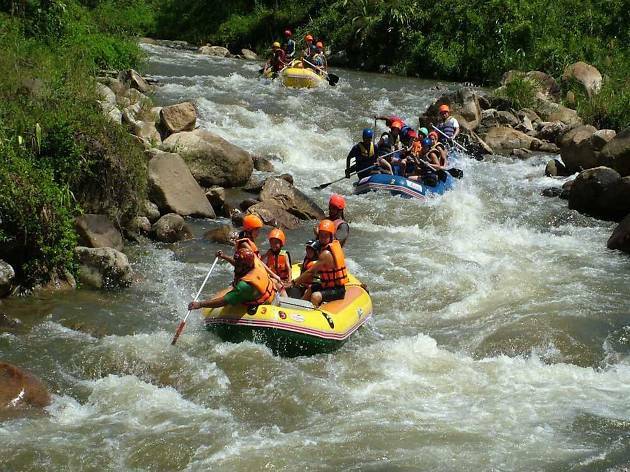 Professional guides help you navigate past the rocks and tackle the frothing rapids. They’ll also do double-duty on the paddling if you’d rather just hold on and revel in the ride. What is it? An ultra-luxurious oceanfront oasis. Why go? The only problem with Phulay Bay is you won't want to leave. Ever. 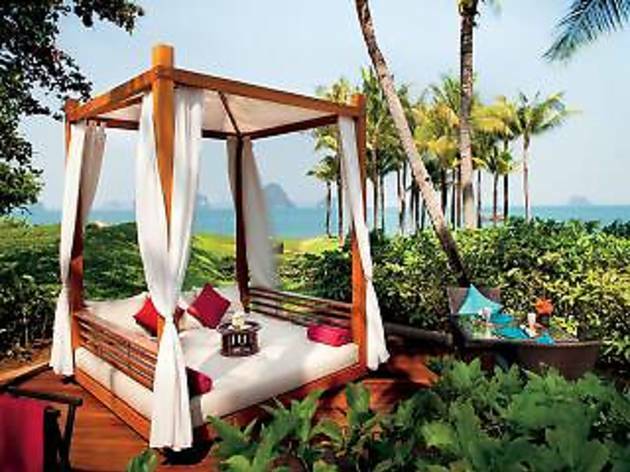 Despite the lure of Krabi’s biodiversity, guests at the very first Ritz-Carlton Reserve (the hotel chain’s high-end brand) may well be happy to just stay put. The resort is nestled amongst the rainforest, with spacious suites and villas scattered throughout expansive and exceptionally beautiful tropical gardens. All the usual five-star trimmings are accounted for: 24-hour butler service, extravagant spa treatments, gorgeous amenities and excellent dining options, including Raw Bar, which serves smoothies and dishes using fruit and vegetables grown at the resort.